For the third Sunday in a row, Spencer Smith claimed a grand prix victory in Europe. Under the tutelage of 2008 Canadian Olympic champion Eric Lamaze, Smith won the CSI** Grand Prix at Global Champions Tour London, England, on Aug. 5; the CSI** Grand Prix at Global Champions Tour Valkenswaard, Netherlands, on Aug. 12; and the $114,626 CSI**** Grand Prix in Valence, France, on Aug. 19. Smith’s first victory in London came aboard Happiness, an 11-year-old chestnut Belgian Warmblood mare (Quadrillo—Burggraaf) owned by the Watermark Group. Nine riders contested the jump-off, with Smith jumping clear in a time of 32.62 seconds to claim victory over Great Britain show jumping team veteran, Amanda Derbyshire, who stopped the clock in 33.32 seconds riding Cornwall BH. 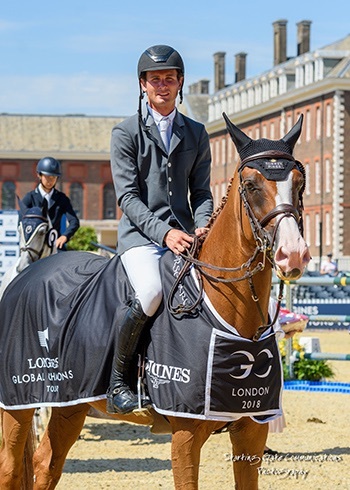 Spencer Smith aboard Happiness at Global Champions Tour London following his first of three consecutive grand prix victories. Photo by Starting Gate Communications. Valkenswaard was the next stop on the Global Champions Tour and Smith had his work cut out for him. From a starting field of 91 entries, 38 qualified for the jump-off in the $29,917 CSI** Grand Prix with another 18 pairs again jumping clear. With speed being the name of the game, Smith and Theodore Manciais, an 11-year-old bay Selle Francais gelding (Kashmir van Schuttershof—Power Light) owned by his family’s Ashland Farms, stopped the clock in 34.21 seconds to win by exactly 1 full second over Brazil’s Yuri Mansur riding van het Indihof Hunter and relegating Simon Deleste of France to third with Conbelleza. With two wins at the two-star level to his credit, Smith stepped up to the four-star level in Valence, joining 39 other horse-rider combinations to contest the $114,626 CSI**** Grand Prix, presented by Axeria – SFAM. In a repeat of their win in the $132,000 CSI*** Horseware Ireland Grand Prix earlier this year in Wellington, Florida, Smith and Theodore Manciais posted the only clear round to take the win without a jump-off. Spencer Smith and Theodore Manciais on their way to the only clear round in the $114,626 CSI4* Grand Prix, in Valence, France. Photo by Solenn Rispail for R&B Presse. Winner of the 2014 Pessoa/U.S. Hunter Seat Medal Finals, Smith made his United States Equestrian Team debut this spring as a member of the Nations’ Cup in Rome, Italy. 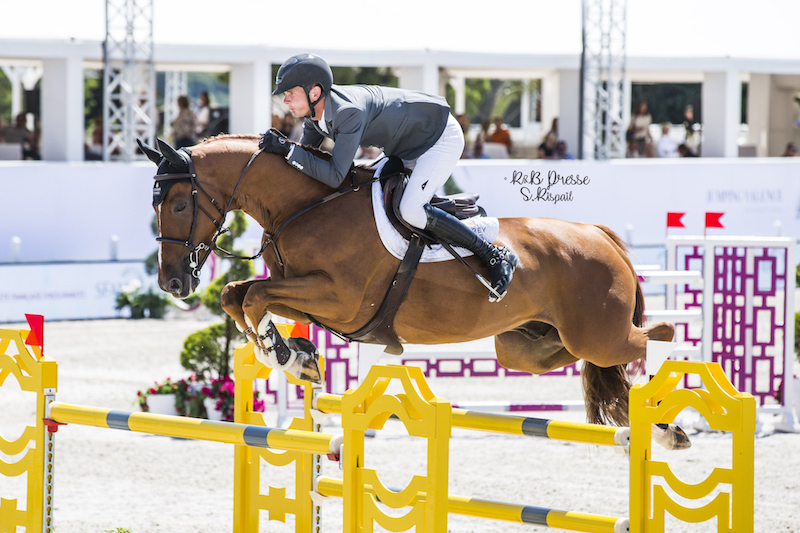 In addition to being one of several athletes who train and compete alongside Lamaze at show jumping’s highest level, 21-year-old Smith also works as a rider for his Torrey Pines Stable with bases in Brussels, Belgium, and Wellington, Florida. “Spencer is a great kid; he works hard, listens, and truly wants to be a student of the sport,” said Lamaze, who has long done business with Smith’s parents, professional trainers Ken and Emily Smith, of Ashland Farms based in Lexington, Kentucky. “I saw something in Spencer. He rode well, and he has been brought up in our sport by true professionals. He had a background in hunters and equitation, and now he’s finding success at the biggest and most competitive show jumping venues in the world. “He is a big part of our business at Torrey Pines and is a huge asset to our team, and he deserves every congratulation on what he has accomplished,” concluded Lamaze.